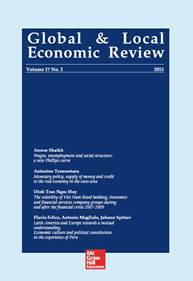 Global & Local Economic Review, founded in 1999, is a biannual journal indexed by EconLit, American Economic Association. The journal welcomes contributions from economics as well as other social science disciplines. Within this orientation, the journal provides a focus on economics research with an emphasis on both institutional and critical perspectives, the provision and use of empirical evidence, and the effective construction of policies. The Editors also strongly encourage submissions in emerging fields of economics, engaging with real-world problems, and having the chance to make a significant contribution on local and global economic issues.